If you're looking for a unique baby shower theme that's also super chic and just plain gorgeous... take a look at these Glitter Carousel Horse baby shower invitations! The design features a pretty carousel horse that's embellished with gold glitter. (The effect is purely photographic. There's no real glitter to fall off and make a mess.) There are pink and blue mini-pattern bunting banner flags at the top of the invite and a pink heart on top of the carousel pole. They're easy to personalize, measure a big 5" x 7", come complete with a standard envelope and also a 100% satisfaction guarantee from the manufacturer. 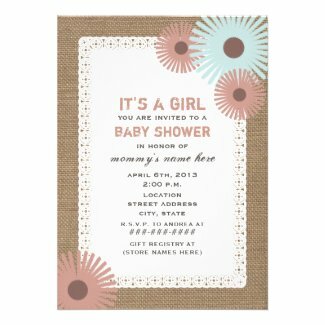 ​The back of these invites have a pink with white polka dots pattern making them especially nice to welcome a baby girl. ​They work well for a circus theme baby shower or a carousel horse baby shower but would also be perfect if the theme is simply something chic, elegant, and glittery. If these aren't your cup of tea, there's plenty more where these came from. If your new snuggle bunny is due sometime this coming spring, why not have a bunny themed baby shower for the little girl or boy? If the shower is being held any time near Easter, or if the mother-to-be is partial to rabbits, that's even better! 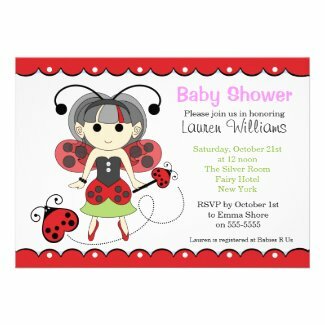 But we think these invites are so cute that you'll want to use them for an anytime baby shower as well. I love this bunny design with the gray background. I think it gives it a baby soft feeling when I look at it but if you prefer a darker background, this same design is available for boys and girls set on a black chalkboard background. If the parents are expecting twins, well... there's double the cuteness in store! 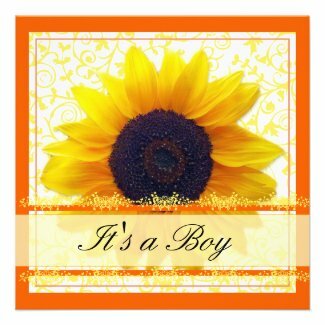 And if you're not sure of the baby's gender yet, there's a pretty neutral yellow one that works for either a girl or a boy. 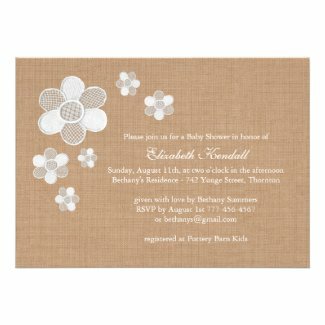 Throwing a Baby Brewing Beer Theme Couples Baby Shower? We've Got Your Invitations! Are you looking for a fun baby shower theme that won't scare the guys away? If you're planning a couples baby shower you can't go wrong with using a beer theme. Of course, the mother-to-be can't imbibe but everyone else can enjoy a cold one in honor of the expected little guy or gal. And if you're planning to fire up the grill and BBQ for the occasion, nothing beats a beer to wash down all those burgers and hot dogs. This fun theme idea is perfect for spring and summer but if your weather holds up, it can certainly work during a warm fall day too. 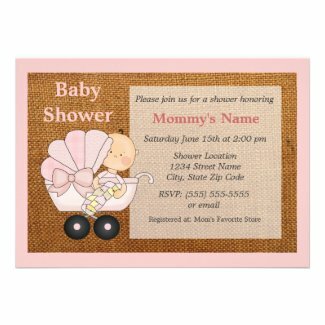 Here's a few of our favorite personalized baby shower invites created especially for a beer and BBQ theme baby shower. And there's plenty more cute designs to see! You'll be able to purchase as many or as few invites as you need. Each one comes with a standard white envelope and Zazzle's 100% satisfaction guarantee. 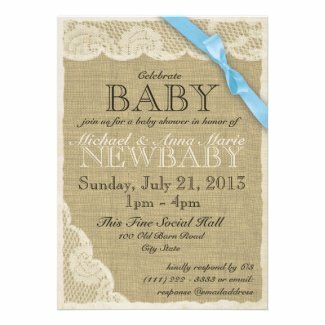 Looking for a hot new theme for your baby shower? One of the fastest growing party theme trends is using succulent plants. Succulents are plants that are usually found in an arid climate, like what you'd find in the southwestern USA. They have fat fleshy leaves to help them retain water. Their unique rustic beauty makes for some truly gorgeous invitation designs and the little plants make delightful party favors that everyone loves. You'll see succulents blooming at a lot of weddings and bridal showers and now, with these sweet invites, you can even have a succulent themed baby shower. 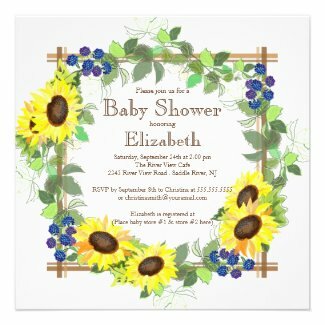 This first one features four succulent and cactus plants sitting in clay pots across the bottom of the baby shower invitation. ​It's a beautiful watercolor design done in several shades of green with pink flowers. ​They're personalized with fun black typography lettering. This unique baby shower invitation features the succulent plants known as Hens and Chicks. 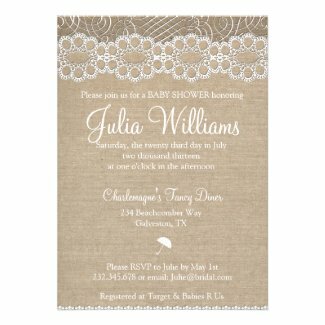 A white overlay makes it easy for your intended guests to get all of the information they'll need to attend your baby's first big celebration. ​The color and style make it the perfect choice for either a boy or a girl. This succulent baby shower invitation design is so pretty for anyone who loves purple. ​It's another watercolor image of succulent plants with fun typography lettering. ​So pretty for an outdoor garden or patio baby shower being held in the spring or summer. Purchase one as a sample. Produced and sold by Zazzle.com. 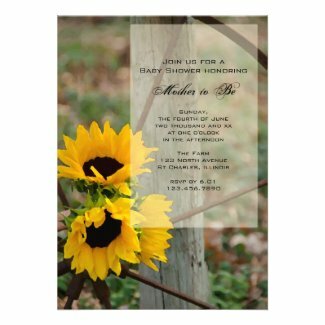 If you're looking for a unique theme for a baby shower that's cute and cheery, sunflowers just might do the trick. 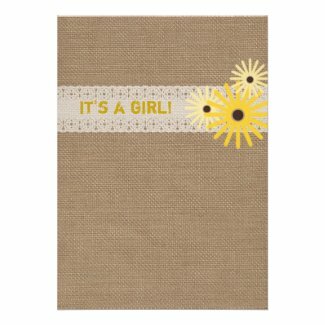 This yellow theme makes it the perfect choice for parents who've decided not-to-know (or for the meanies who've decided not to tell) but there's a couple sunflower baby shower invites here that are gender specific and even a darling one especially for twins. And of course, you can customize any of these to say whatever you'd like. 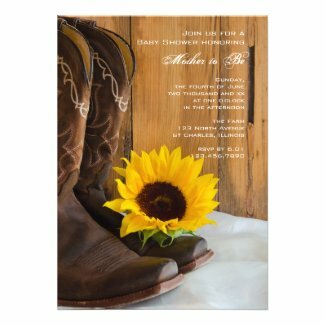 These are my choices for the top 10 invites for a sunflower-themed baby shower. Click on your favorites to see a larger image and to learn more about their affordable pricing. I know, they're all so adorable that it's hard to choose just one design. Well, I've got news for you... there's a lot more to see. Of course, you'll want to carry the sunflower-theme across the board at the party. Using big beautiful sunflowers as a centerpiece for the buffet table is a great way to decorate and I also found a photo of an adorable dessert you might want to try. Aren't those Sunflower Oreo Cookie Cupcakes just to die for? And who would have ever thought to serve them in little flower pots. So so cute! Admit it. You're now thinking about serving these at the shower. And if you do, you can send the tiny flower pots home as party favors... maybe include a little packet of sunflower seeds too! What fun! Huge thanks to the photographers who made their work available to us with a creative commons license. Click each photo to see the original. What could you use this box for at a baby shower? The latest trend is bringing folks back to the casual charm of burlap. It's being used in all kinds of craft and decorating projects and it's becoming uber popular when images of this course fabric is used on invitations for all types of parties, including and especially for baby showers. Burlap alone screams casual fun. It's come a long way from just being used to cart potatoes to market. With the addition of lace and other soft fabrics or florals, the true beauty of burlap is brought to the surface. When planning your party, you can use it as simple tablecloths and buffet runners, to decorate jars as party favors, to make gorgeous wreaths, to create all kinds of custom decorations and to invite your guests to a casual chic shower. Here's my favorite picks. Browse through and be sure to click on your favorites to learn more, see larger images of the designs, or to personalize and purchase yours today. 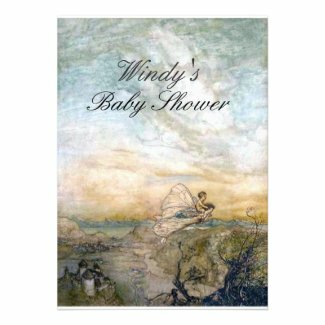 I'm recommending these design ideas for a spring or summer baby shower because of the light and airy feel they convey but you can use them for showers at any time of the year. 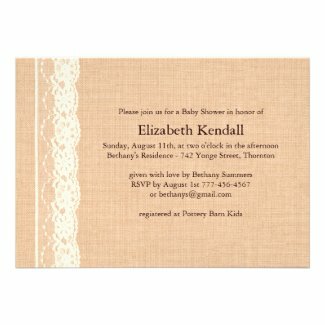 Each of the featured invitations measure a large 5" x 7" and come complete with a white envelope. If you haven't found the perfect one yet, please visit Rustic Burlap Baby Shower Invitations at Zazzle to see the entire selection. The designers are constantly adding new designs and color alternatives so I'm sure you're going to love what you find. 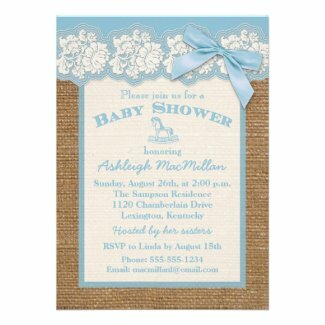 Please feel free to share your ideas and thoughts about using burlap for a fun baby shower in the comments section here. We love hearing from our readers. Thank you to the photographer who made their work available to us through a creative commons license. The featured image of the burlap box is just gorgeous. Click it to see it in it's original location.